Ten years ago, Lucas Woods stepped into Gary Weisman’s lab with a fresh perspective on P2 cell receptors. Now, as an experienced lab manager, Woods dives deeper into the role of these receptors in a myriad of diseases. Woods came to the Bond Life Sciences Center after graduating from Missouri State University in Springfield with a degree in cell and molecular biology. 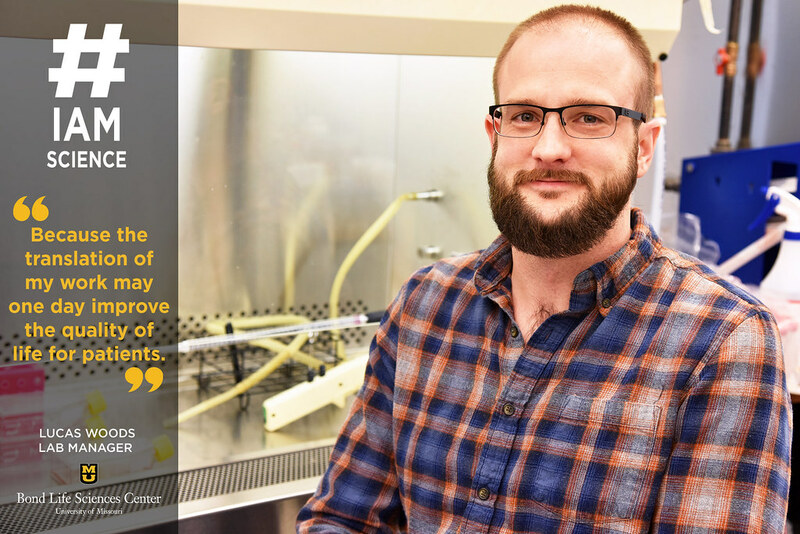 He studied P2 receptors as a part of his undergraduate research with Dr. Richard Garrad, who completed his post-doctoral research in Weisman’s lab. Garrad recognized Woods’s interest in the area of study and recommended he continue his research with Weisman at MU. 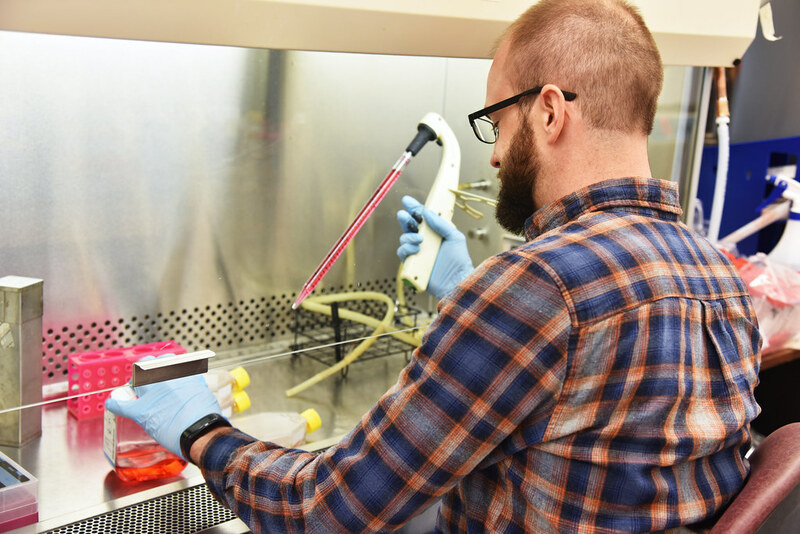 “The initial plan was to work in Dr. Weisman’s lab for a year or two then enroll in graduate school, but after I started here, one thing led to another and here I am, 10 years later, still doing the same research I have been doing for the past 12 years,” Woods said. Although Weisman’s lab researches the function of P2 receptors in diseases such as Alzheimer’s disease, autoimmune diseases and oral cancers, they are currently investigating the manipulation of P2 receptors in Sjögren’s syndrome. Sjögren’s syndrome is an autoimmune disease primarily affecting women at later stages in life where the immune system attacks and damages the salivary and lacrimal glands, reducing the ability to produce saliva and tears. This can lead to dental caries, periodontitis, yeast and bacterial infections, digestive disorders, loss of taste and difficulty swallowing, all of which reduce the quality of life for patients. The progression of Sjögren’s syndrome can also lead to the development of lymphoma. Currently, Weisman’s lab is focusing on two drugs that target P2 receptors to systemically reduce the inflammation in the salivary gland and improve saliva flow. 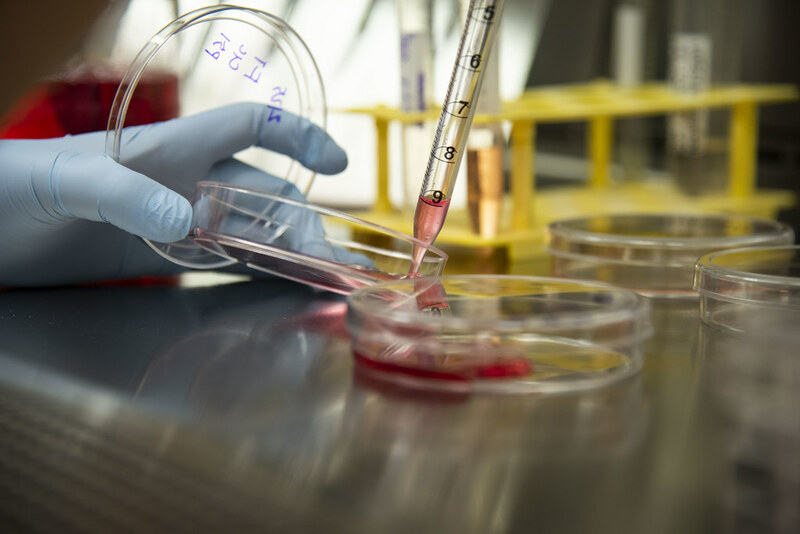 The lab uses mouse models of human Sjögren’s syndrome to test the effectiveness of these two drugs in blocking the response of P2 receptors to extracellular ATP, which can exacerbate inflammation if left unchecked. “We were joking the other day that when people ask us what we do for a living and we say we collect mouse saliva, they don’t believe us,” Woods said. 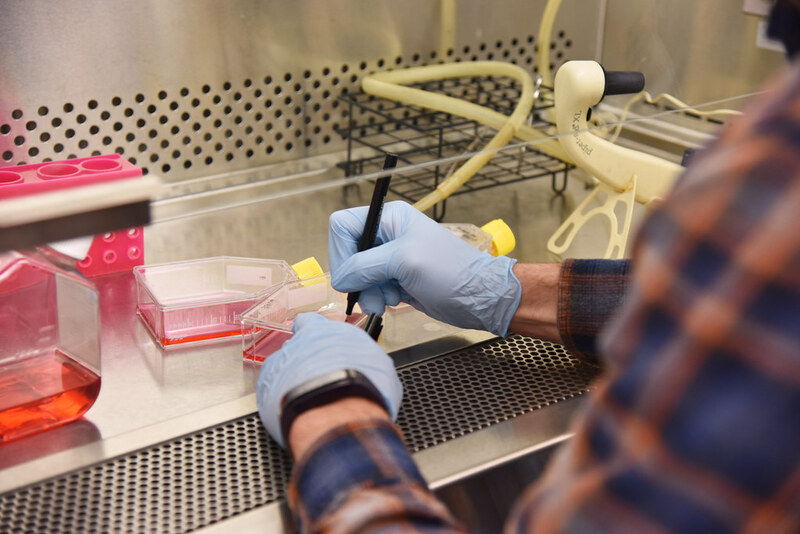 Rather than trying to generate a specific drug for clinical use, the lab aims to establish the idea that if a safe drug is found that can block these receptors and improve the Sjögren’s-like symptoms in mice, then it may translate as a therapeutic strategy in humans. After working with Weisman for 10 years, it’s safe to say Woods has learned a lot. But the main lesson that he has taken from his experience is that effective communication of science is key. In conjunction with his research, Woods is also taking classes toward completing a graduate degree. “I’m in a unique position right now where I am both a research staff member in the biochemistry department and I’m a student in the department as well,” Woods said. Woods’s interest in science sparked when he realized that it could lead to limitless discovery. The idea that he could be the first to discover something that the entire world doesn’t know about yet drives him in his research. When not in the lab, Woods enjoys running and playing with his two kids, Audrey and Edison. Eventually, Woods hopes to run his own lab. When asked whether he would continue his research with P2 receptors, Woods said it would be in his best interest because of his long history in the field of study. “P2 receptors are so ubiquitous in the body, there’s no shortage of questions to ask that need answering,” Woods said. 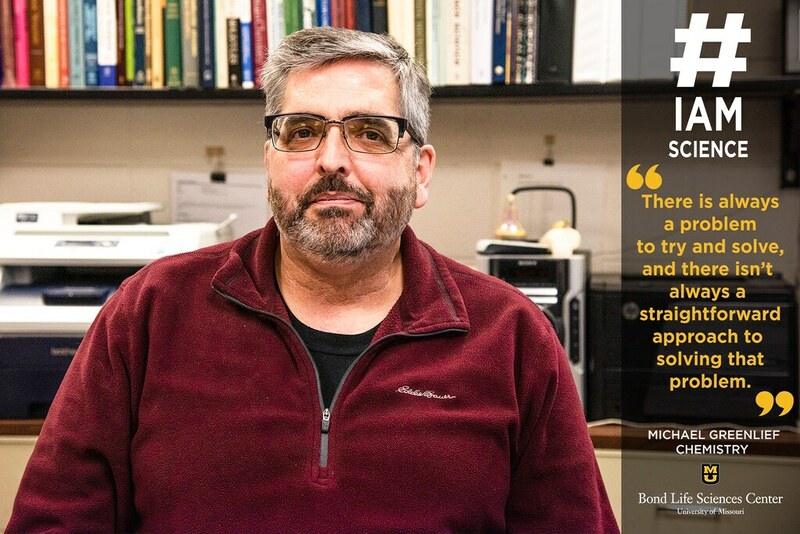 A casual conversation amongst friends two years ago turned into an initiative to better connect scientists doing related work across the University of Missouri campus. Hot Topic research networking was born out of informal discussions, growing into a cross-campus and cross-discipline network. Carter explained that by helping facilitate these discussions, Bond LSC helps widen the scope of normal science and pull different researchers from across the MU campus together. Ultimately, that can lead to new, exciting types of research. Three main research networks emerged from initial efforts, focusing on cancer biology, host/pathogens and metabolomics. In each discussion, a main presenter either shows successes they are experiencing in their labs or difficulties they face. By bringing diverse minds together, they can learn from one another and help each other overcome challenges in their fields. At a recent research network for metabolomics, Aaron Ericcson, assistant professor of veterinary pathobiology, spoke about discoveries in his lab regarding colon and rectal cancer in mice. He spoke about how easy it is for scientists across disciplines to never meet or know what other fields may be doing differently right down the street. “I always pick up something, some new tidbit of knowledge, but it’s definitely opened up some new collaborations. No matter what talk I go to, in the back of my mind I’m thinking of it in a microbial context,” Ericcson said. At the end of the discussion, two gentlemen stayed behind to talk with Ericcson about his work and possibly begin a collaboration of their own. Michael Petris, professor of biochemistry and Bond LSC primary investigator, was fascinated by the relationship between microbiome and cancer. “For me, what’s cool is the different models that are available, which I can learn from and use in my own work,” Petris said. 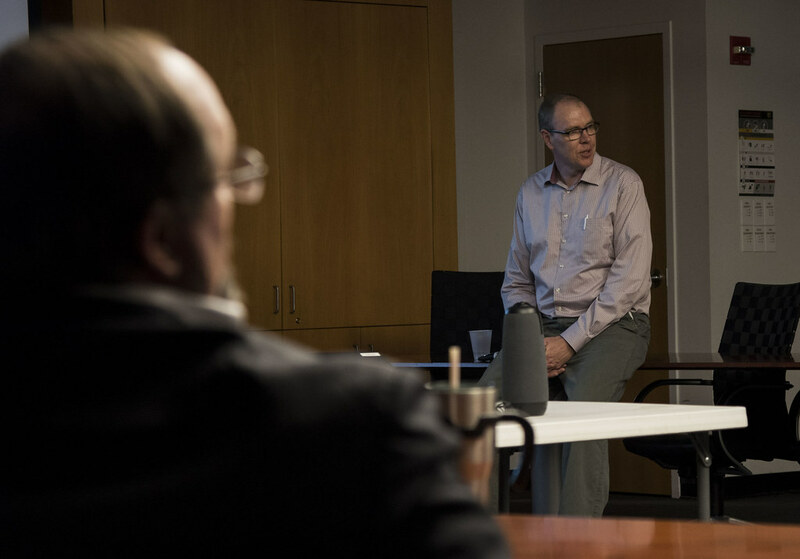 He and Mark Hannink, professor of biochemistry and Bond LSC primary investigator, began discussing new possibilities for their own research afterwards, excited by new thoughts and ideas. Hot Topic discussions happen at Bond LSC every week with the hope of inspiring more cutting-edge research. Anyone from any field is welcome to attend the discussions and to learn about the various practices happening all around campus. Check out Bond LSC events page to see when the next Hot Topic session is. In high school, Michael Greenlief had teachers that led his curiosity into a passion for science and problem-solving. Decades later, he is an associate professor of chemistry at the University of Missouri and director of Charles W. Gehrke Proteomics Center located in Bond Life Sciences Center. Depending on the day, Greenlief could be found many places on campus, but his favorite part of MU is working with students. “They keep things going; they keep things fresh,” he said. Through all aspects of his roles on campus, there exists an underlying educational component. From lecturing in class, to teaching young scientists how to use advanced equipment, Greenlief enjoys helping and talking with young minds in a field that is anything but regular. Proteomics is the study of the structure and composition of proteins, and Greenlief’s core facility and lab use mass spectrometry to make these discoveries. Greenlief enjoys the complexity that comes with science. “There is always a problem to try and solve and there isn’t always a straightforward approach to solving that problem,” he said. Whether it’s health related, environmentally related or anything in between, he believes that science isn’t just something that exists in the lab. “Even though some of science seems esoteric, in the end, it always comes back and looks at something in the real world,” he said. Greenlief has been at MU since 1989 and has experienced the transition that science has gone through since that time. He said the changes are a matter of complexity and expertise. “The questions that are being asked and that need to be addressed have become more complex, and tied to that is expertise. Since it’s more complex you need more expertise than you may have by yourself,” he said. He said that much of science now depends on interdisciplinary work, so scientists have had to learn to work well with one another. Looking to the future Greenlief doesn’t plan on going anywhere. Greenlief plans to continue educating and learning from the students he interacts with across campus, helping to influence the next generation of science and scientists. Learn more about the Gehrke Proteomics Center and services this MU Core Facility offers at proteomics.missouri.edu. How do plants take up and use iron? For David Mendoza, a scientist at Bond Life Sciences Center, it’s not an inconsequential question. He works to decipher the answer in an effort to better fortify the food we eat. His most recent published work further pinpoints where and how a plant senses the amount of iron, focusing on the leaves. Initially, previous researchers believed the iron sensor was in the roots because plants absorb water and nutrients from the ground. Scientists now describe a circuit of sensors in plants where the leaves sense the iron status of the entire plant and tell the roots to continue or stop uptake. After studying and comparing iron availability in the model plant Arabidopsis using different growth conditions, Mendoza and his team found that the abundance of different proteins, called transporters, were vital. Transporters can move water, nutrients and other molecules within the plant. In the leaves, they found that a lack of one transporter — Oligopeptide Transporter 3 — causes an over-accumulation of iron throughout the plant. Additionally, they found that this transporter mediates a ‘shoot-to-root’ signaling that prevents excess, potentially fatal, iron uptake at the root level. By moving plants from iron-available conditions to iron-absent conditions, the team tracked the abundance of OPT3 and other genes over time. They found that the responsive genes in the veins of the plants respond quickly to varying levels of iron. Because iron is an extremely reactive metal, and technically a micronutrient, too much can be as bad as too little. “There has to be a right balance of having the right concentration inside the cells, and how exactly plants achieve this homeostasis is not known,” Mendoza said. Mendoza predicts he and his team will find several more iron sensors in the roots, leaves and vascular tissues of their plants. Mendoza credits the work of researchers before him for providing the toolbox necessary for his research. Knowing that there are iron sensing markers in different cell types, Mendoza and his team were able to ask a simple question — which cell responds faster to iron deficiency? For Mendoza and his team, the challenge lies in the fact that plants don’t like to accumulate iron. They are working to better understand how to convince the plant to safely store more iron in a way that is available for humans. “The trick in biofortification is to convince the plant to accumulate more iron in available tissues in a safe and bio-available way,” Mendoza said. However, increasing the amount of iron in plants can have harmful effects if not careful. Mendoza proposes a double strategy to increase iron uptake in plants and express an iron storage mechanism to prevent iron toxicity. According to the World Health Organization, 80% of people globally do not have enough iron in their bodies and 30% of people are anemic. Iron is necessary for the body to generate hemoglobin so that red blood cells can carry oxygen to the rest of the body. This is why some people with low iron levels may experience dizziness, weakness and fatigue. The main contributor to iron deficiency is our diets. Staples such as corn and rice supply a large portion of our calorie intake, however, they don’t have nearly as many nutrients as greens. In the future, Mendoza also hopes to look into making plants more selective for nutrients even if they are grown in the presence of other toxic elements, such as cadmium or arsenic. This research was published in the Journal “Plant, Cell & Environment” in March 2018 and was funded by the US National Science Foundation, CAREER, NSF EPSCoR, Department of Energy and the Vietnam Education Foundation Training Program. Amith Reddy has been in academia for some time and doesn’t plan to leave anytime soon. With two master’s degrees under his belt, Reddy is only a few months away from completing his Ph.D. in plant sciences. Reddy began his secondary education career in India where he spent most of his life before moving to New Mexico for his second master’s. 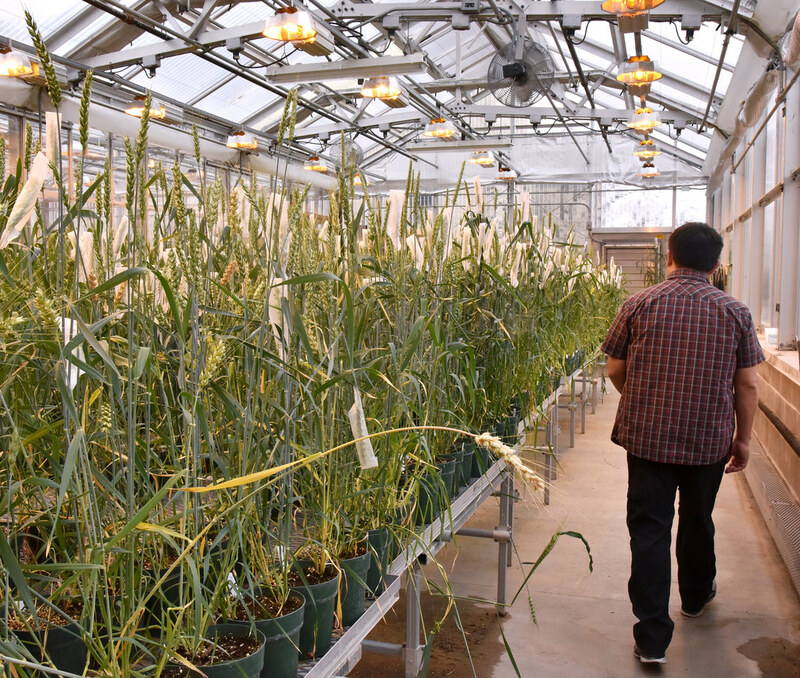 He cites the hands-on application of science that he first began to experience at the Directorate of Sorghum Research in India as the turning point of his interest in plant sciences. 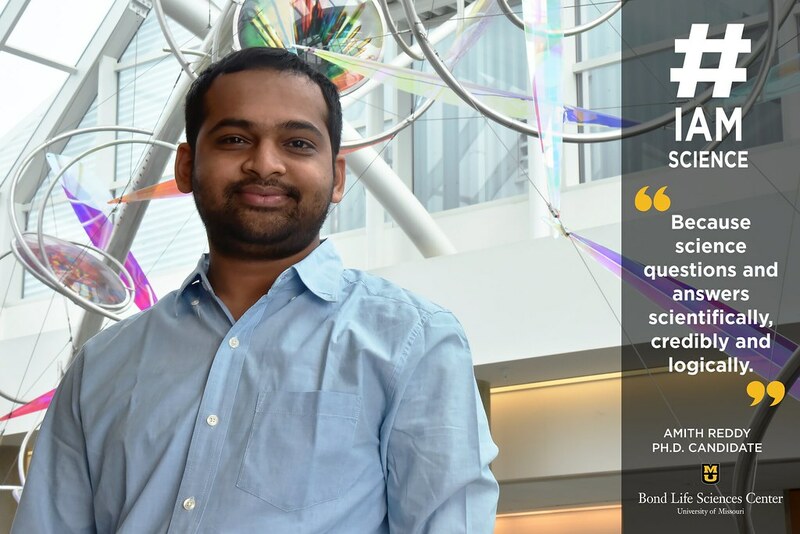 Reddy started his doctorate program at the University of North Texas but transferred to the University of Missouri when his mentor, Ron Mittler, moved his lab to Bond Life Sciences Center just ten months shy of completing his degree. While some may be thrown off by a big move just months before graduating, Reddy embraced the change positively. “I wanted to continue my work with Ron because he is an excellent mentor,” Reddy said. Reddy firmly believes that having a passion for research and a good mentor will bring success to academic research. For his Ph.D. dissertation, Reddy researches the stomatal response in plants after being exposed to light stress. More simply, he wants to study how the leaves of plants communicate with each other and react to stress in order to survive. When a plant experiences a high temperature, it loses water more quickly. Reddy has found that reactive oxygen species in plants can signal the stomata to close to help retain water. Before, researchers believed the stomatal responses in plants took up to one hour, but Reddy has found that the response can react in as little as one minute. “The uniqueness of this study is that it focuses on light stress. In the past, people have studied bacteria, heat and cold stress, but there are still many missing aspects related to light stress,” Reddy said. After completing his degree, Reddy hopes to use his research to find a way to alter the stomatal responses in plants so that the plants can balance water loss and carbon fixation. “The long-term goal of this project is to build up stress-tolerant plants that enables better yield and better capabilities to withstand stress conditions in the field,” Reddy said. Following graduation, Reddy hopes to conduct research and teach at an academic institution. 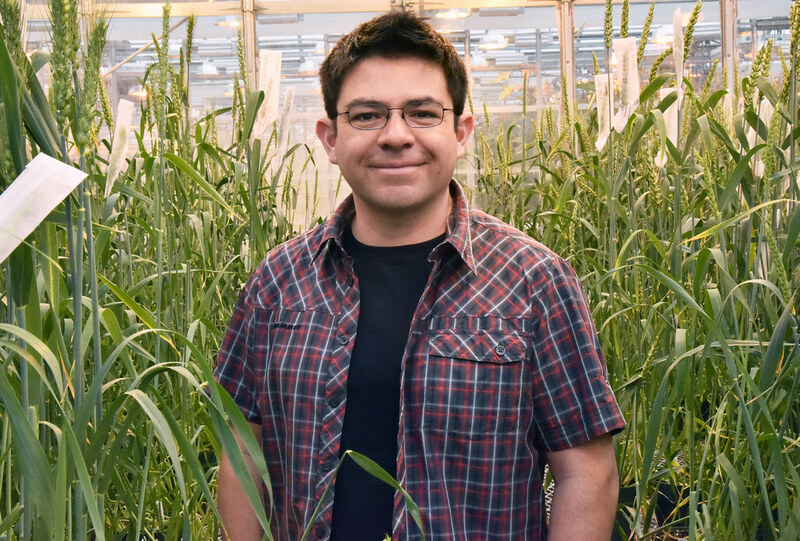 Although he doesn’t know whether he will start a postdoctoral degree or begin teaching first, one thing is for sure — he will continue to research and identify what’s still unknown to widen the biochemical and genetic standpoint of knowledge of stomata responses in plants. 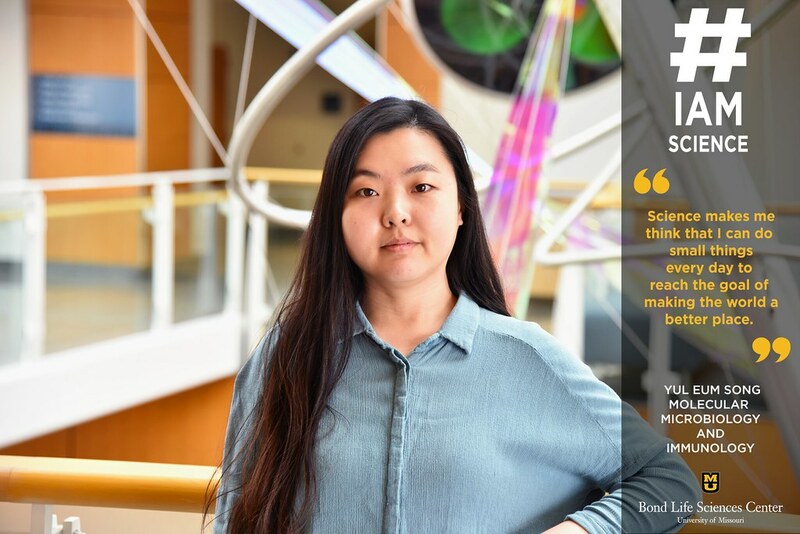 As an undergraduate student, Yul Eum Song had experiences that put her on a path to help create change. Now as an experienced and educated doctoral researcher, she studies the mechanisms of retroviruses in the lab of Bond LSC’s Marc Johnson, and she continues to love science and the way it answers questions and positively influences the world. “I like viruses because they can be deadly, so it’s really fascinating for humans to learn about,” Song said. Song received her undergraduate degree from Dongguk University in Korea. Though she started out as a philosophy major, she realized her love of science and decided to add an additional major of life sciences, or biology. While at Dongguk, she became interested in viruses, which ultimately influenced her decision to come to MU. Song says her goals in life all center around one idea, making the world a better place. She believes that each small discovery can lead to big ones. 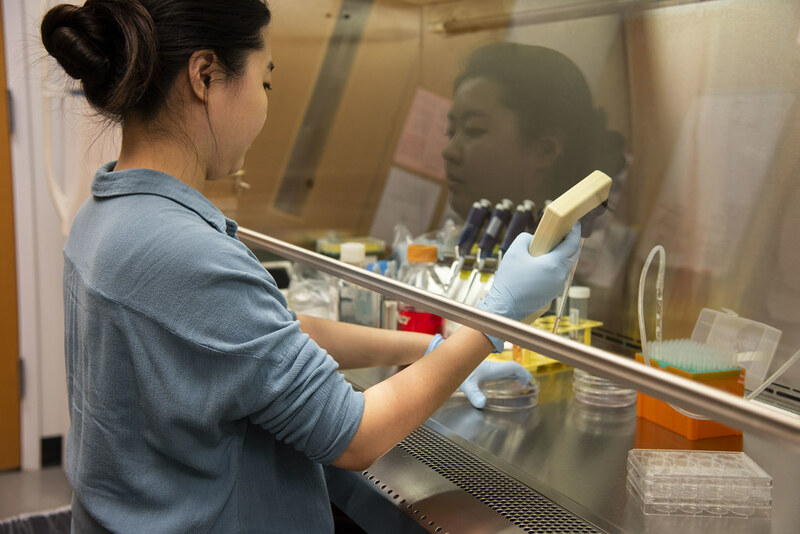 In Johnson’s lab, Song focuses her research on the mechanisms of retroviruses such as HIV, particularly Env glycoprotein. She is fascinated by how viruses utilize their hosts through very minimum genes and acknowledges that learning about how a virus operates at the basic level can give a scientist clues on what further questions to ask. In May, Song plans to have finished her Ph.D. and to continue her education at St. Jude Research Center for her postdoc. While there, she will have the opportunity to observe doctors and put her research into context. She will be able to observe the ways in which doctors use research to create therapies. She is excited to work with translational research and capture the big picture. Song thinks that understanding the entire context is vitally important. By seeing both the big picture of her own research and the larger picture of how that research gets used in the medical world, she and other virologists can avoid problems and create better solutions. Though she is still figuring out what specific steps she will take in the future, she holds tight to her goal of positively influencing the world through science.